Nice to know I'm not the only one collecting Columbi . 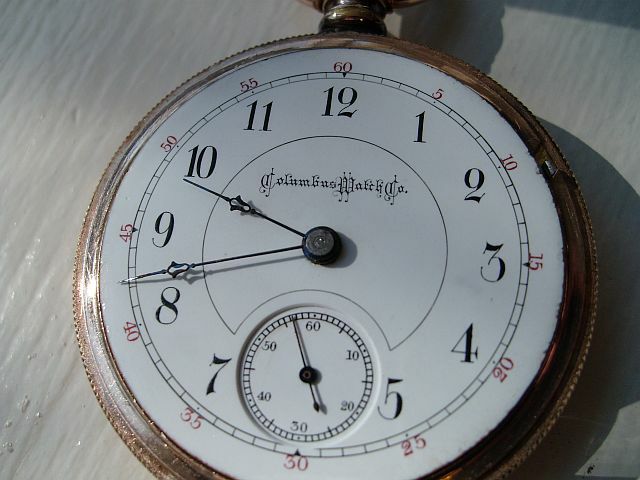 That log dial is unbelievably beautiful! I saw one like it in pictures once. 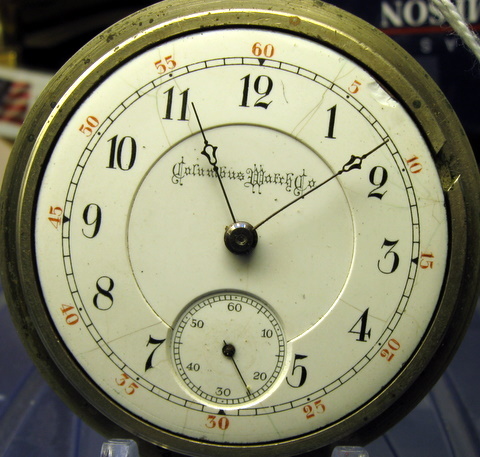 That dial is on a level all its own! I might even bookmark this page so I can return and drool from time to time. I didn't even mention those unique hands! What a watch! 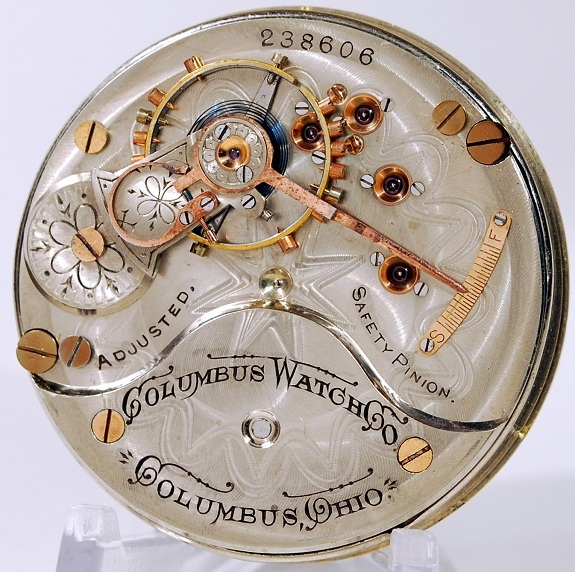 I wonder if Columbus made that dial for the Woodmen of the World organization? Nice watch Eric, I also agree that the dial is fantastic. 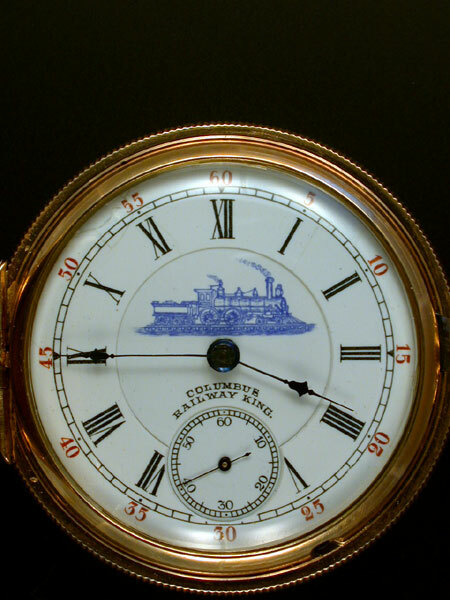 I would think it was a WOW dial, Elgin made some that look just like that & some where I saw an ad once that they were for the WOW. I've never heard of the Woodsmen of the World. Who can tell me more? I don't know if you like going to cemeteries but their members have some rather unique tomstones in the shape of trees or logs. 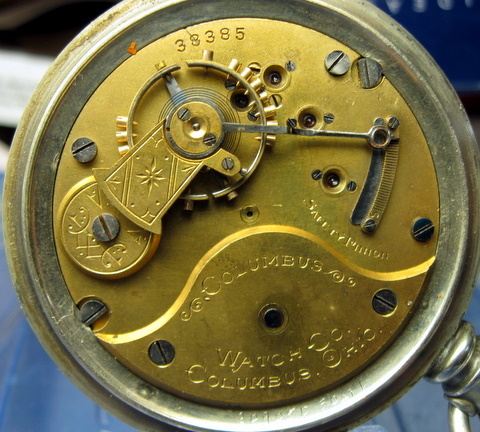 Here is another 18s Columbus with serial number 38385. This is a size 6 Columbus. Here is the size 6 case back. Nice dials, Jerry and Bruce. I didn't know Columbus made a 24hr dial. 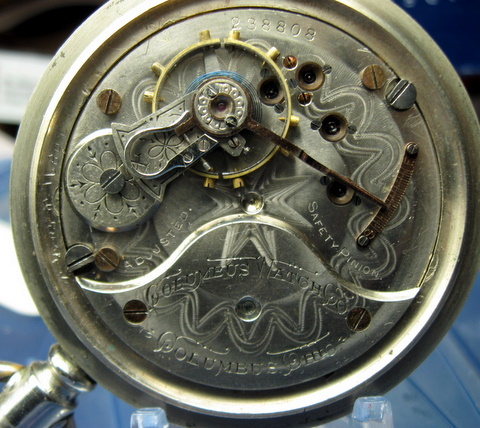 I didn't realize the Log Dial had two variants: notice that mine has the seconds arranged radially, while Dave's are horizontal. 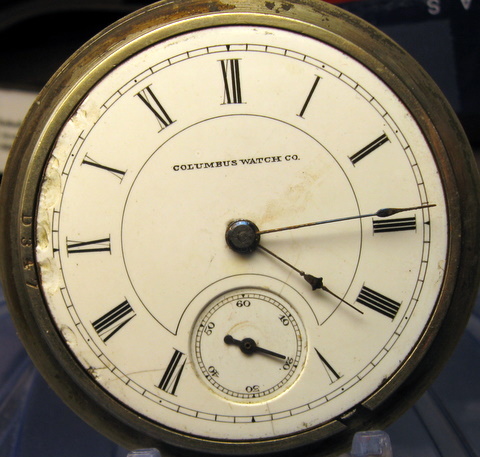 Have a Columbus Hunter, I finally found the missing regulator (they tended to break I think) and I need to send it in for clean/oil but the private label double sunk dial is near mint. 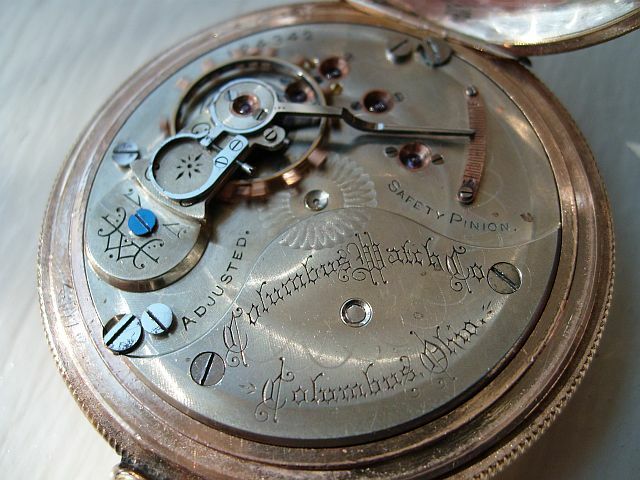 What does your private label Columbus dial say? I think C.H. Thompson was a businessman in Michigan at least that is something I think I dug up at one time. 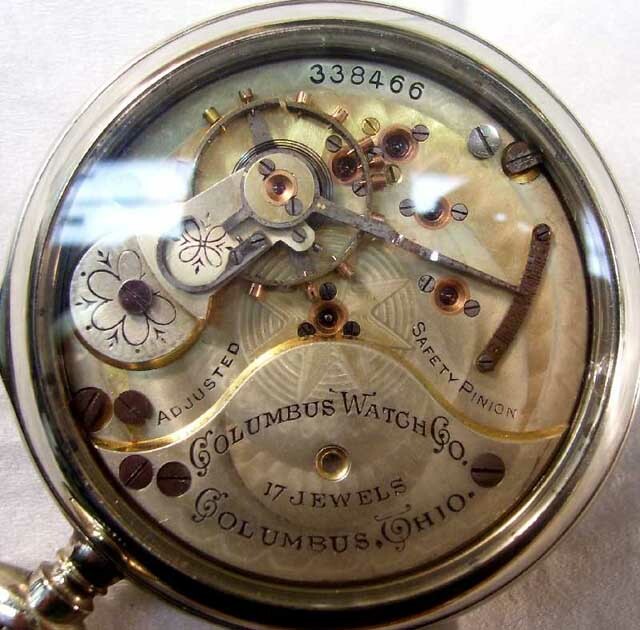 The serial number is 178280 and it is marked adjusted and safety pinion along with Columbus Watch Co., Columbus Ohio. 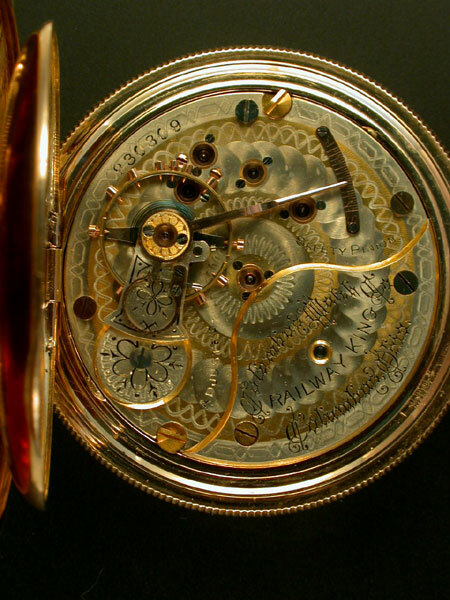 That would put it around 1891-92 and I think it is grade 34, 15J movement if my memory is correct. 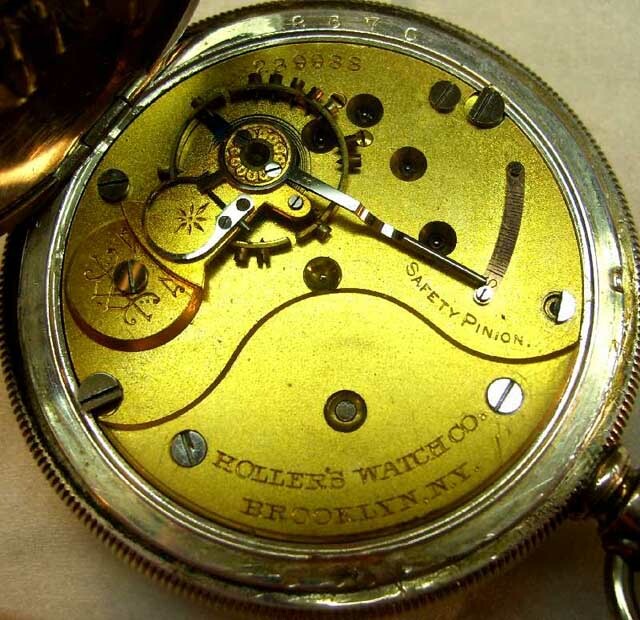 And from the RR guide book it was RR approved which most decent 15j adjusted watches were. 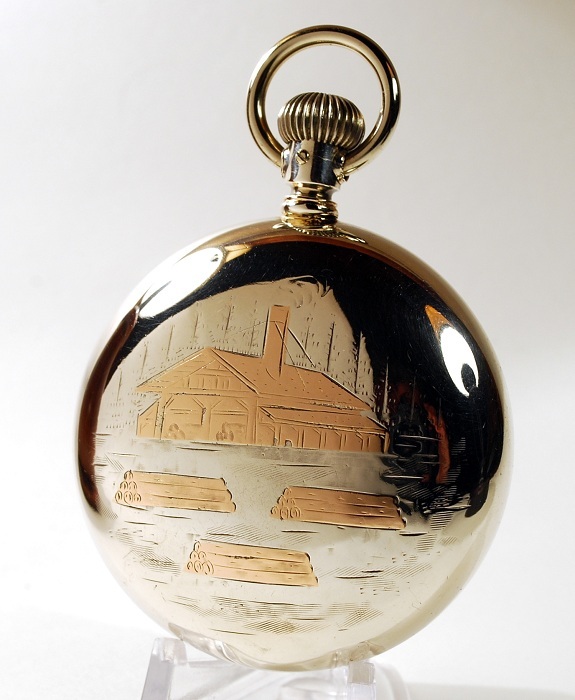 It has a very nice brass case, it's not gold but as you can see it has shine on the inside so I am not quite sure what it is. 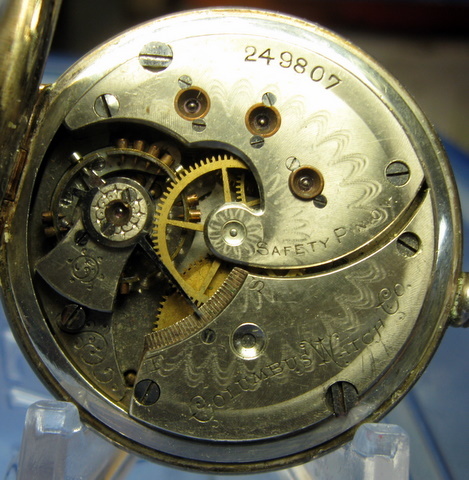 It isn't worn out because the detail is nearly unharmed with age/wear so the watch does not look like it was abused over the years but during servicing someone took the regulator spring off and did not put it back or even put the two screws back so I had to track the spring and the screws down. I realize this cannot compete with the previous entries, nevertheless here is a bad picture of my one and only Columbus P.W. You pictures look much better than mine, looks like it has the same dial as mine with the exception of the private label, nice looking watch. 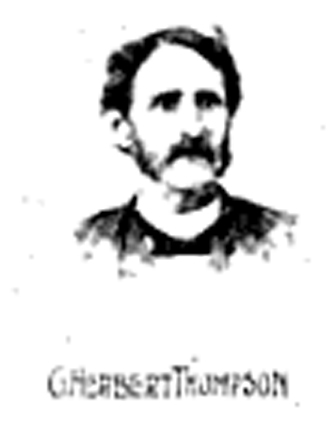 If you are interested, you watch is from C. Herbert Thompson, according to the 1900 census for Marshall, Calhoun Michigan he was born in March of 1848. His wife (Cornelia) & son (Herbert E.) were living with him along with his 30 year old brother-in-law Floyd Bassett. Both CH & Floyd were listed as jewelers. 1883 C. Herbert Thompson bought the vacant lot near the old post office and built a two-story brick building. 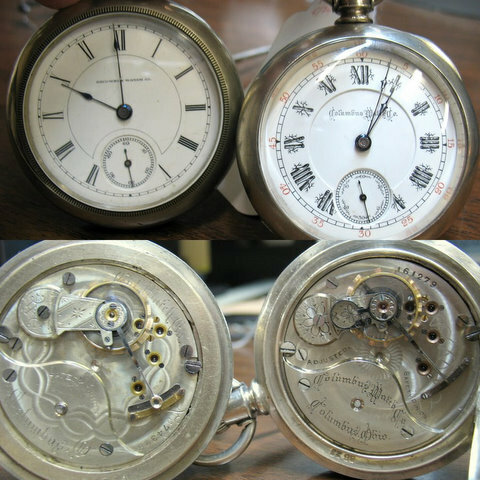 Mr. Thompson was a watchmaker and jeweler. 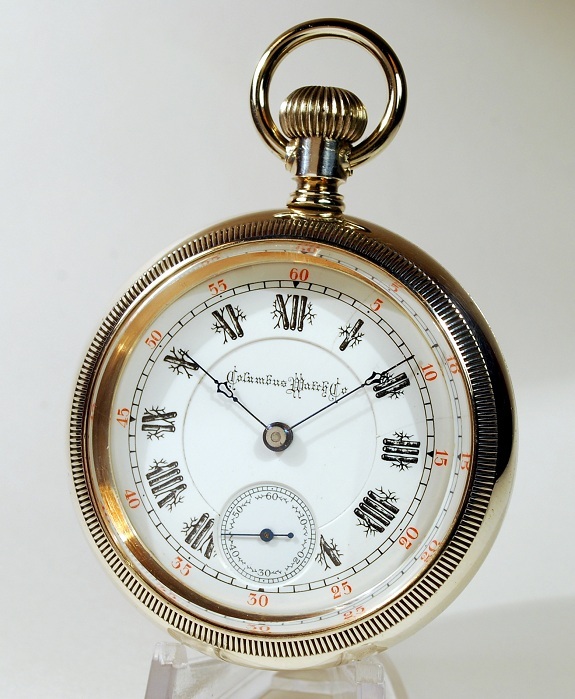 C. Herbert Thompson is a jeweler, born and bred. He has been associated with the business all his life. Born in 1848, he has lived in Marshall since 1860, and has been very successful in his undertakings. Had another son, Louis B. Thompson who was an engraver. I guess it makes sense that he was a jeweler and probably sold some watches with his own business logo. 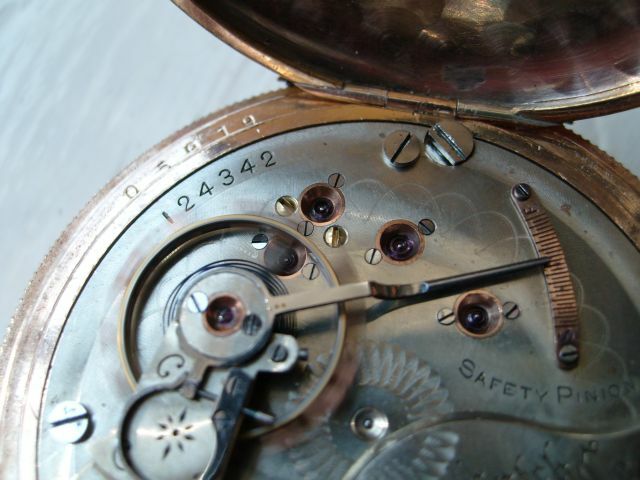 I have not seen any other watches with the same labeling, it is a nice watch and needs to be cleaned/oiled, it does run but who knows how long it has been since the last service. Thanks I will print that out and put it with the watch for the future. 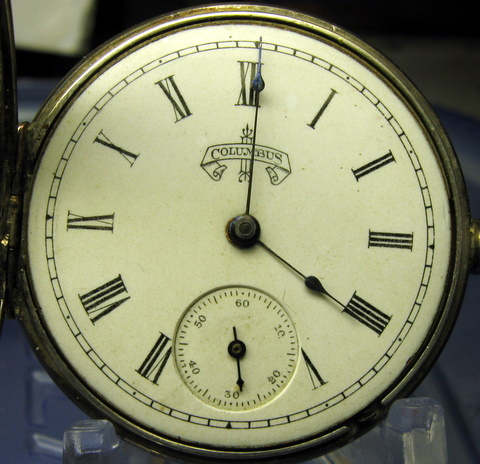 Decent two-tone movement, although the plates are a little washed out. Columbus 16s. For some reason I haven't seen many of these. Uncommon Private Label movement. 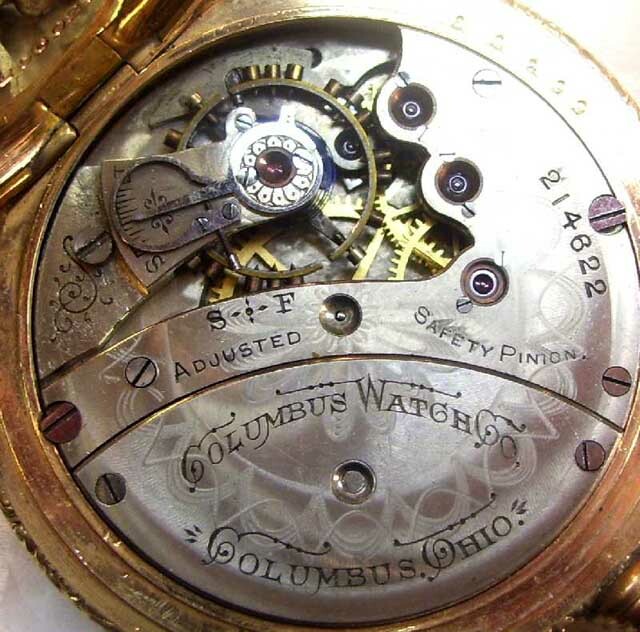 The dial that came with the watch is just a typical fancy style Columbus dial. 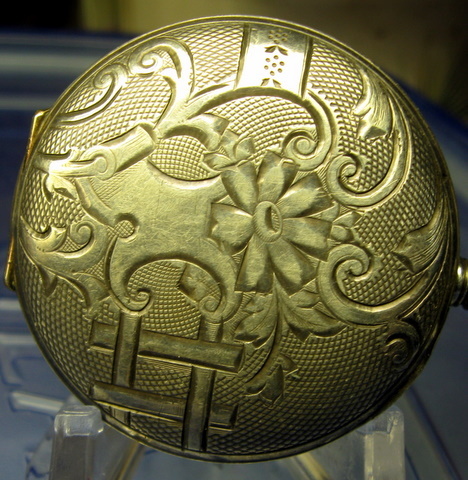 The case, which looks original, is sterling silver.